Sadly, our budgie quartet is now a trio. Sugar Plum, the youngest of our group, died suddenly. The three of us are perhaps a little closer than we were, and we are much more tame, spending a lot more time with our human foster family, sitting on children`s fingers and exploring the world outside our cage. We would surely like to go to a forever home, perhaps as a group, if that`s possible. hree budgies aren`t more trouble than two, and we are ten times more fun! 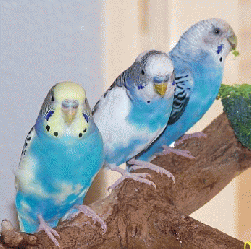 Is there someone out there waiting for three sweet budgies to brighten your mornings and beguile your days? Although our names may have you thinking of junk food, our foster family wants you to know that we are four little SWEETIES who LOVE our veggies and pellets! Not only is our diet totally healthy, but we love to exercise, too. We are enjoying all of the fun things pretty little budgies can do in a nice big, wide cage... lots of fluttering, climbing, playing tag and, of course, socializing with one another. With a little encouragement, we will even step up onto your finger! We love toys and are dedicated to being physically fit because we are always on the go... now if only we could go to our forever home. Won`t you bring us home to your house so that we can make every day sweeter for you? Hello, out there! I`m Skittles! (drumroll) I`m Starburst! (drumroll) I`m Sugar Plum! (drumroll) I`m Snickers! (crescendo!) (...all together now...) We`re the budgie quartet! Ta Da! Ok, I`ll take over from here. I`m Starburst, the senior girl budgie. I`m named for the pretty burst of yellow on my head. The good-looking boy budgie sitting next to me is Skittles. We`re probably related somehow, but budgies don`t keep track of those things. Sugar Plum is the pretty white baby budgie, and Snickers is the little blue girl. Not only are we a musical quartet, we`re as sweet as our names. We make budgie music all day and our foster mom says we fill the room with bright color and sunshine! Although we are friendly and happy to be together, we`re not bonded budgies, just good friends. So if there`s a home out there with room for a budgie quartet, we`d be the perfect fit. But if that doesn`t work, maybe you could adopt two sweet-as-candy budgies? I promise you, any two of us will make your home bright and your life more sweet.